Just recently I complained how fast January passed. Today I can’t believe it’s March already. I know, February is a short month and so forth, but there still were four weeks of it somewhere, right? I’m getting better with actually using what I already have and love: I wore my favorite perfumes on thirteen different occasions. Frederic Malle’s Iris Poudre got three promenades (I had to be sure before I wrote my déjà vu article) and, while I’m thinking on the size of a bottle I should buy, Diptyque’s Tam Dao was granted two appearances. My other perfume loves, I’m sorry for neglecting you but I promise to spend more time with each of you soon. * Most popular notes: top – bergamot (I should probably stop counting this most commonly used note in perfumery), cardamom and lemon; middle – jasmine and rose; base – sandalwood and patchouli. 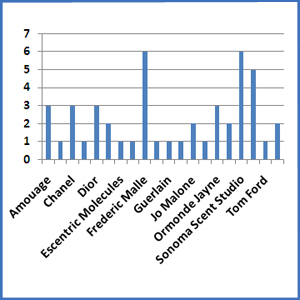 This entry was posted in Favorite Perfumes, My Stats and tagged Diptyque, Frederic Malle, Iris Poudre, perfume statistics, Sonoma Scent Studio, Tam Dao. Bookmark the permalink.